An 8-year-old boy is in an induced coma after a brick flew through the passenger window of the car he was travelling in, striking him on the head. The boy is a victim of a series of four reported incidents of brick-throwing last Thursday, allegedly perpetrated by the same man on the N12 near The Glen shopping centre, south of Johannesburg, Netwerk24 reported on Monday. 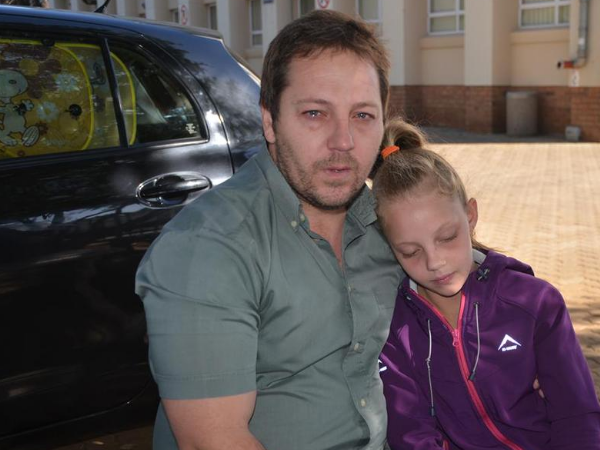 Justin Slabbert and his two children, Caden and daughter Eden (11) were on their way to their Benoni home on Thursday after being picked up from school in Krugersdorp. At about 14:30, a man walking on the N12 threw a brick through Slabbert’s passenger window. After hearing the noise, Slabbert checked on his two children immediately. His daughter Eden was unharmed, but he received no response from Caden, who was bleeding from the head. Luckily, a Netcare911 ambulance was travelling on the same stretch of road at the time of the incident. Slabbert, spotting the ambulance in his rear view mirror, pulled off to the side of the road to seek medical help for his unconscious son. Before long, a second car had pulled up to the ambulance on the side of the road, reporting a similar incident. The driver, Darrell Badenhorst, reported that his 42-year-old girlfriend, Marionette Schwab, had been struck on the head by a brick a few metres further down. She too, was unconscious, and bleeding from the head. A third car also pulled up to the paramedic to report the same incident, but no injuries were reported in this incident. Both victims were treated at the scene and transported to hospital. Doctors said that they feared the 8-year-old would not survive the ordeal, but a successful surgery has seen him make a remarkable recovery. He is expected to be brought out of the coma on Monday. Part of his skull had been removed to prevent further swelling on the brain. Both Schwab and Caden are stable and will have brain scans this week. Metro Police Chief Superintendent Wayne Minnaar, spokesperson for the Johannesburg metro police, confirmed a brick was also thrown through a fourth car window on Thursday. It was unclear whether anyone was injured in the incident.